This is for informational purposes only. You can kill someone if you don't know what you're doing. 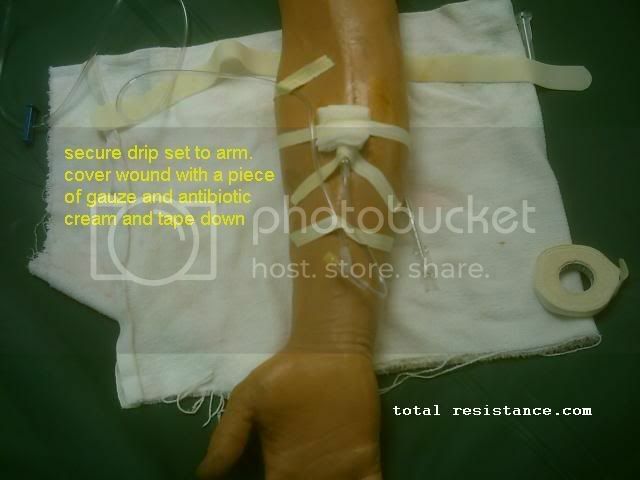 If you properly give someone an IV and save their life they will probably still sue you since if you are not credentialed to do this procedure your practicing medicine without a license. If you are a medic or nurse and use these items when not at work you are most likely in violation of local, state and federal laws since items like angios and .9% NACL (salt water) are controlled substances. Thank the gov and it's unConstitutional and failed war on certain drugs for this. 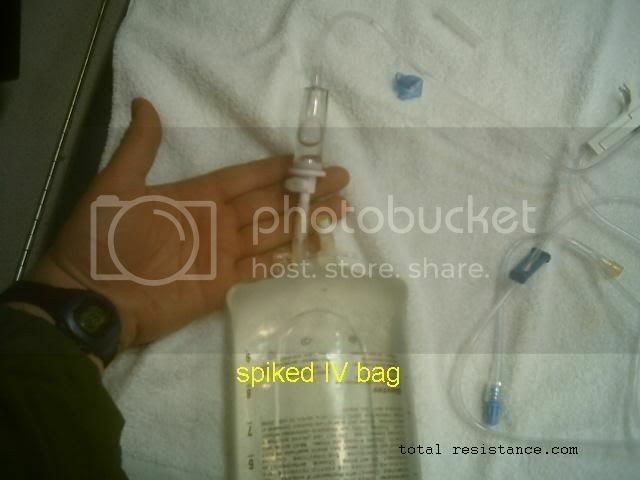 To the trained patriot medic being able to start an IV is a valuable skill. It can be used to replace fluid from dehydration, blood loss and burns. 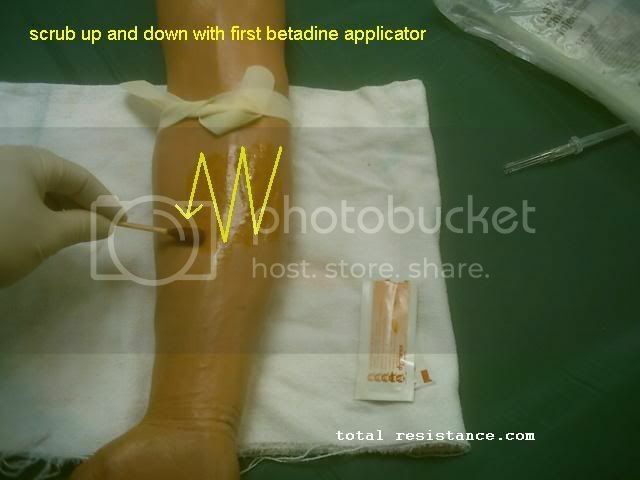 Be a route for drug administration or raise the sugar level of your hypoglycemic patient. It's up to the reader to become familiar with these and the symptoms including recognizing a pyrogenic reaction which if it happens you need to discontinue the IV. 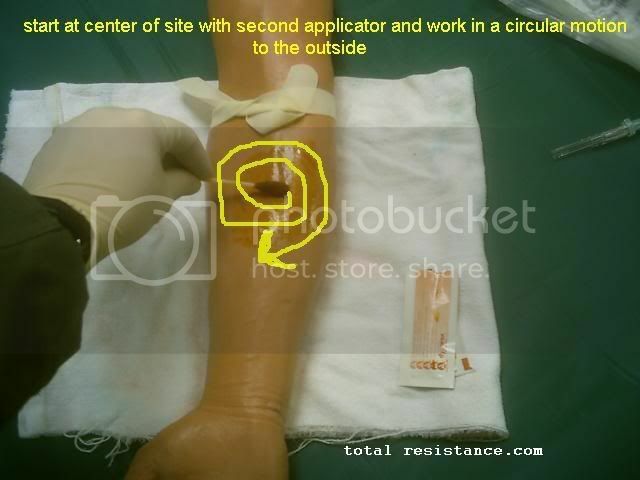 Catheter sheer can come from moving the Teflon catheter back and forth over the needle till a piece breaks off and goes into the vein. And as I was told in class it shows up very well during an autopsy. Also if you infuse too much fluid too quickly it may back up into their lungs. 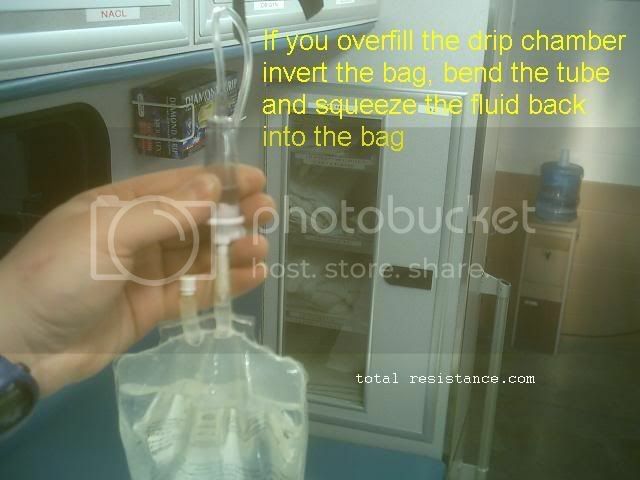 If it's winter time cold IV fluid will kill your patient. 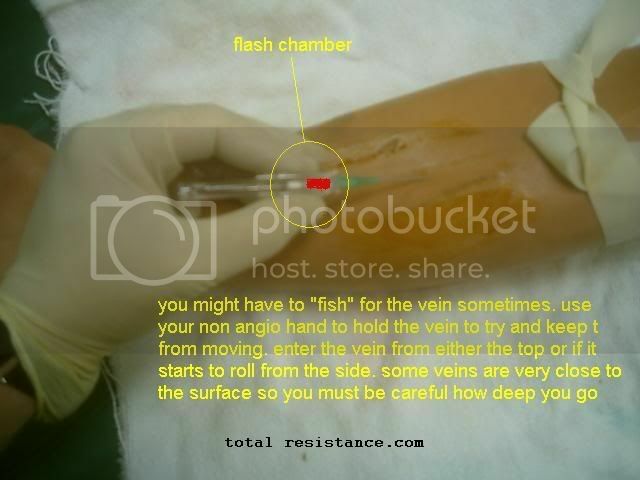 You want a vein that is straight and not branching off unless it is below your site. The branching will help anchor the vein then. 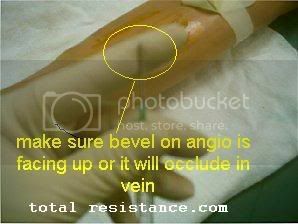 Do not try an IV in the wrist and if you put one in the hand you might need to stabilize the limb to keep the IV from being pulled out. The back of the hand, jugular vein and leg veins are alternate sites although the last two are not as easy, safe or common. If your gonna do a jugular stick you better know what your doing. Decide what fluid you want. The patriot will usually only have one of the following since most outside hospitals including EMT's don't have access to blood or synthetics. 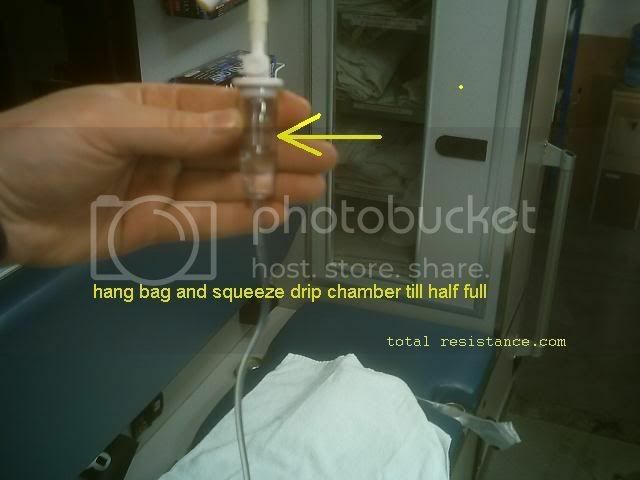 .9% NACL (normal saline), D10 (10% dextrose in water), D5 (5% dextrose in water, used mainly for delivering meds) and lactated ringers. 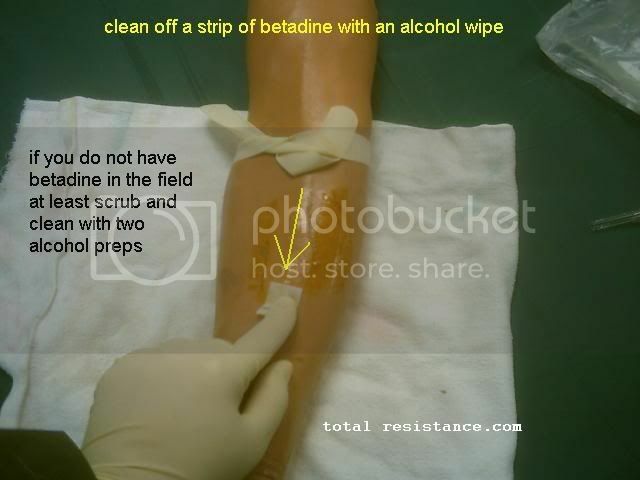 Most of the time the patriot medic will want .9% NACL or lactated ringers. If you try and replace fluid with D10 you will be giving them a bunch of sugar which you don't want to do unless their problem is low blood sugar. no floaters - you don't want to inject fluid with green slime in it. 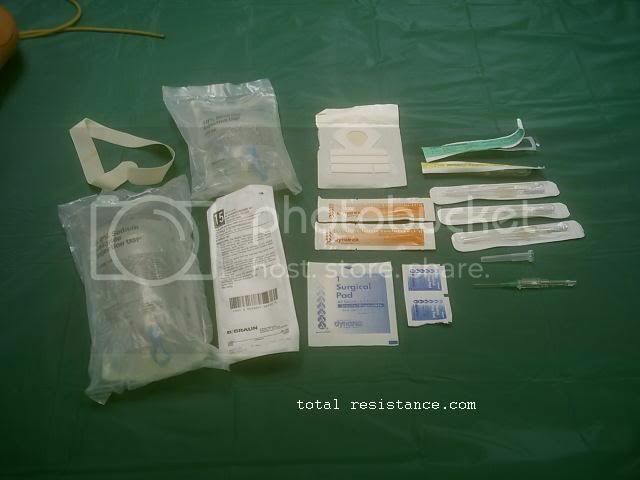 There are several choices for drip sets. Your gonna want a 10/12/15/20gtt or macro set most of the time. 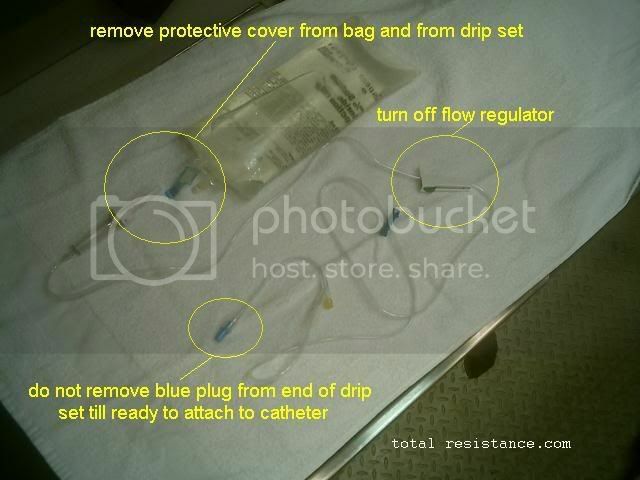 The 60gtt or micro set is used for a more precise drip rate for med administration or children. If all you have is a 60gtt it will still work for adults. 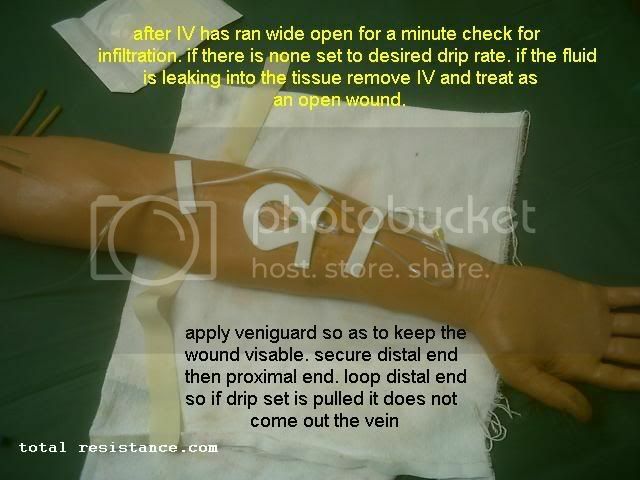 Most of the time you will usually run your IV wide open or KVO. 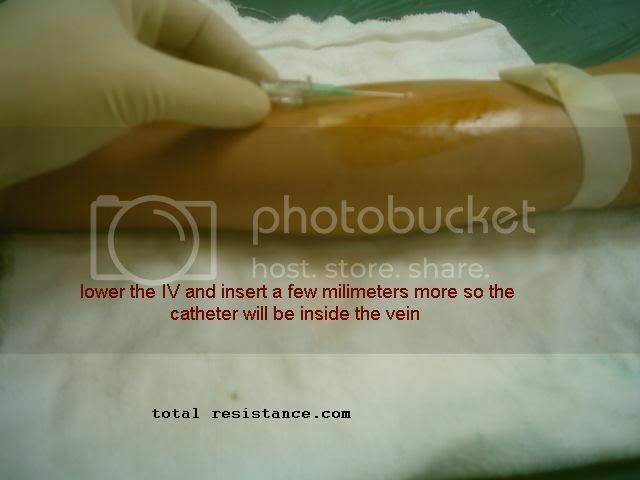 If you have an IV established without fluid going into the vein the catheter will clot and the patient will have to be stuck again. There are many different types of angios, sized from 12 - 26 I believe and are color coded. For trauma bigger is better but if you put a 12 into someone (think coffee stirrer) you might make them jump out of their skin or blow the vein. 16 or 18 would be better and depending on the injury you might need two. 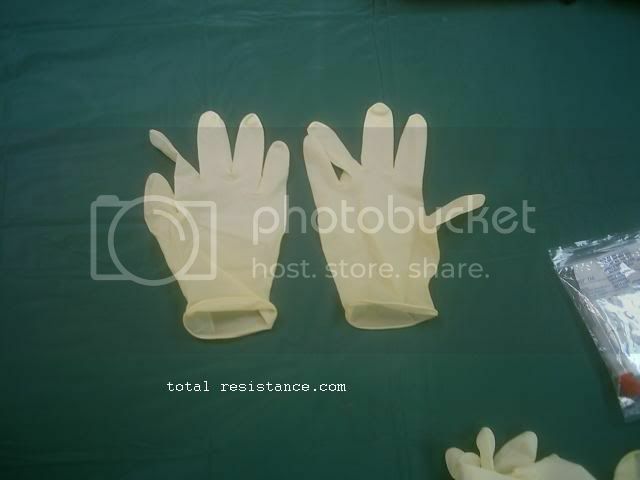 The most important item for you is a set of gloves. If you have cuts on your hand or even when your skin cracks in winter you have a direct route for their body fluids to enter into you. Once you have spiked the bag you need to open the flow regulator to get all the air out. If there are stubborn air bubbles they can be tapped out. Make sure to close the flow regulator and keep the luer end where it won't become dirty. 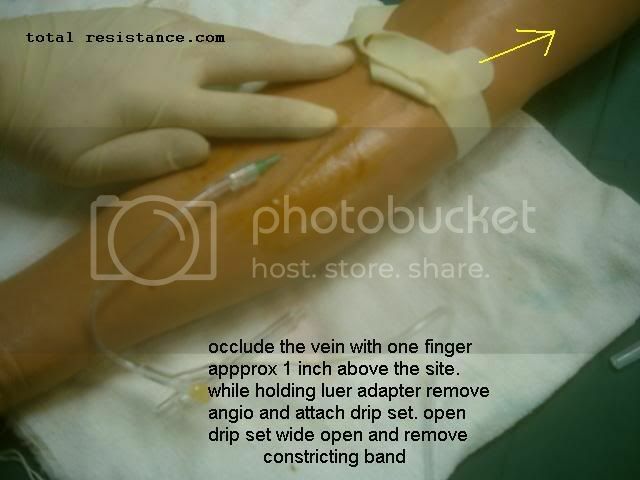 If you cannot find a vein add another constricting band or heat pad to make the veins come to the surface. Also have your patient open and close their fist a few times or tap the site to release endorphins and make the veins pop up. If you do not have a constricting band you can also use a BP cuff. 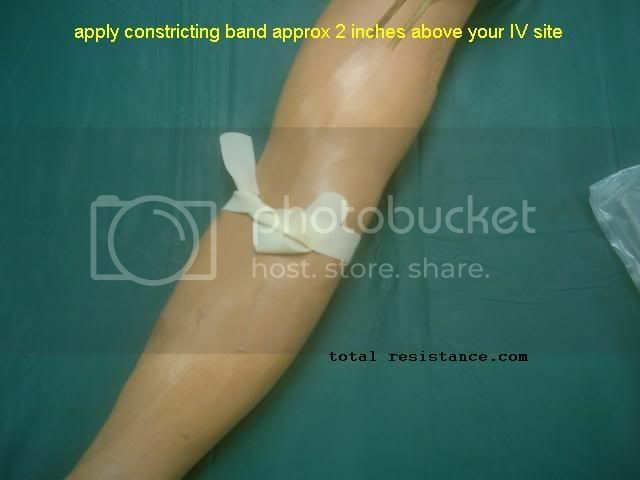 You want the band to be tight but not so tight that you do damage to the patient. Make sure the vein you chose doesn't have a pulse or your poking an artery. 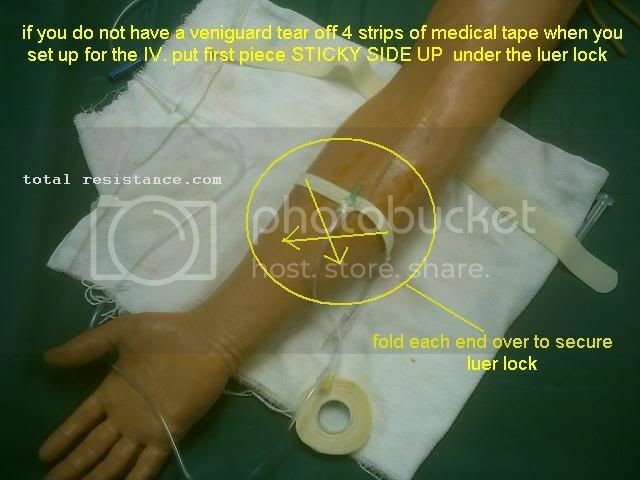 Not removing the constricting band is the most common problem with an IV. 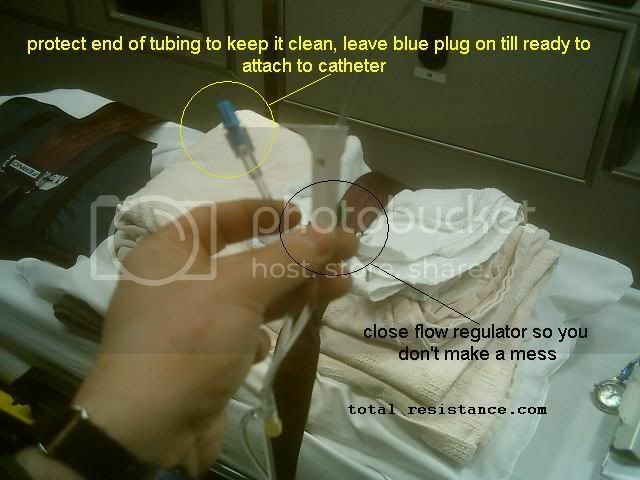 If you do not remove the band the fluid in the bag will not flow.